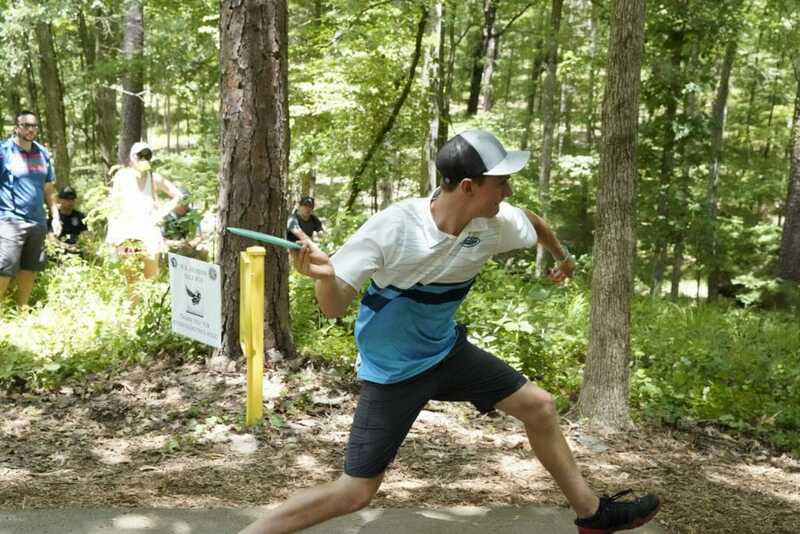 APPLING, Ga. — After a nearly four-hour round at the International Disc Golf Center’s W.R. Jackson Course, Ricky Wysocki stoically walked out of the pro shop and toward the canopy that provided shade for hole 10’s teepad. Before he could get too far, though, he was stopped for autographs by some young fans and happily obliged. As he answered questions about his round, away from crowds and the sunshine, two more admirers approached: a 10-year old boy seeking a signature on a bubblegum pink mini that was nearly covered in them, and a 9-year-old Orlando City SC fan who simply wanted a high five. Instead of asking either to wait, or being dismissive, the man who is currently on top of the disc golf world thought back to the days of his youth, when he experienced the awe of playing his first high-level event with the players he had grown up admiring. 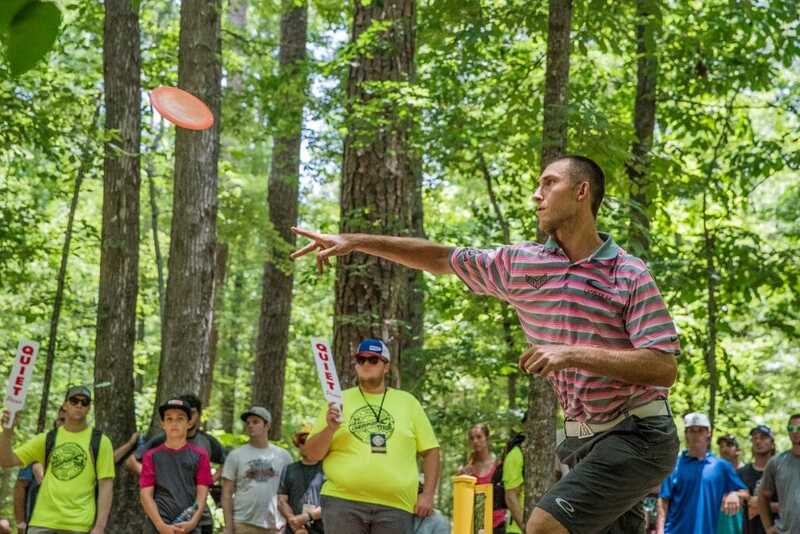 Wysocki has come a long way from that shy young professional, and that evolution was on full display here as he unleashed a course-record setting 13-under par 55 to pull away from the rest of the PDGA Professional Disc Golf World Championships field. His second straight day of double digits under par brought him to a 33-under par 170 total, and he takes an eight-shot lead into today’s final round at Fort Gordon’s Marine/Navy Disc Golf Course. He’ll be chased by another young pro, as Wisconsinite Adam Hammes staved off an overnight bout with food poisoning and fired off a 10-under par 58 to move to a 25-under par 178 total. Simon Lizotte’s 9-under par 59 brought him to a 24-under par 179 total, tying him for third place with JohnE McCray, who logged a 4-under par 64. Wysocki, now knocking on the door of back-to-back world championships, was doing his best to remain even-keeled after the dominant performance. Entering the day knotted up with McCray at 20-under par, Wysocki broke the stalemate on Jackson’s 660-foot opening hole. Two clean forehand drives put him on the green with an easy birdie look, while McCray’s second shot hit a tree and he was forced to settle for par. The pair pushed on hole 2, as Wysocki scrambled after his drive landed in a creek and McCray’s birdie attempt from 20 feet splashed off the right side of the chains. Both put their drives within tap-in range on the short hole 3, then battled through the rough and off trees en route to pars on the 744-foot 4th. After that, Wysocki put the pedal down, taking a birdie on hole 5, then following up the effort with a 50-foot Sockibomb on hole 6 to take his second in a row. At the same time, McCray continued scuffling, narrowly missing lines and landing off the fairway as he carded a bogey-par combo. Though he recovered with birdies on 7 and 8, Wysocki began to separate on the back nine with a stretch of five consecutive birdies. There was nothing terribly flashy about the run, with nary a clutch putt or ridiculous escape shot to be seen. Instead, Wysocki relied on consistent accuracy and precision — and a bonus birdie on the 744-foot, par 4 hole 14 — as he made his way closer to a championship. Wysocki’s 1067-rated performance marked his second day in a row of bogey-free golf. He has only logged two strokes over par through the tournament’s 54 holes. A similar style could be seen in Hammes’ game. Playing in front of a sizable gallery on the chase card, he displayed the calm of a player twice his age as he deployed a well-rounded mix of backhand drives and forehand touch shots. He rarely found himself in trouble and converted on nearly all of his putts from inside the circle. By the time he landed his 20-footer for birdie on hole 18 — and even before that, really — he had leapfrogged all three of the upper echelon pros with whom he shared the spotlight. Though he didn’t show any signs of distress, Hammes came into the round uneasy after getting sick the night before. He chalked it up to something he ate at the Innova team dinner, but he didn’t let it derail his performance. Hammes has experience with crowds, as he came in second place after a playoff during the 2016 United States Amateur Disc Golf Championships. He said he didn’t think he would be too rattled during today’s final at Fort Gordon, and that his play at Worlds had already exceeded his expectations. In other rounds at Jackson, Nate Doss continued his ascent up the scoreboard with a 10-under par that moved him into eighth place. James Conrad moved into an 18th place tie with his 9-under par showing, while Zach Melton moved from 29th to tied for 16th by shooting 8-down. Lizotte, who is nine strokes behind Wysocki, was not ready to concede that he would be playing for second place. Instead, he pointed to the Jonesboro Open, where he nearly chased down another nine-shot Wysocki lead, as evidence that he was still in the hunt. If he’s going to take advantage of any other player’s misfortune, though, Lizotte will have to make his own and try to ignite a recently cold putting game. After another day where McBeth was plagued by inaccuracy off the tee — “I’m just scrambling, then putting it in the circle, then saving my par. Scrambling, putting it in the circle, par,” he said — his title hopes look bleak. Still, he was clear that, with 11 strokes to make up, he would at least go out in a blaze of glory. Wysocki said he wasn’t planning to just coast to the victory, though. And with a gaggle of family members in town from South Carolina, he was looking to put in a strong performance and partake in a celebration that he wasn’t able to in 2016 — even if he wouldn’t let himself get too excited yet. He did allow for one small mental indulgence, though. As he signed all those autographs after the round, he marked a “1X” alongside his scrawl to denote last season’s title. Those signatures might soon become a collector’s item. The lead card tees off for the final round of the PDGA Professional Disc Golf World Championships at 1:10 p.m. Eastern today at Fort Gordon. Real-time updates and scoring will be available via Ultiworld Disc Golf’s Twitter and PDGA Live. The post Wysocki Pulls Away, Leads Worlds By 8 With 18 To Play appeared first on Ultiworld Disc Golf.